OK, Mom and I have talked about me guest posting before, and I figured this was the perfect time. She’s on her way back from the regional in Virginia, so she can’t edit what I have to say! HA! So I’m in stealth mode here, sneaking in and sharing these fun samples. Actually, I’m sure I won’t get in too much trouble—Mom and I talk about the blog all the time, and I’ve loved checking it out every time she posts something new. 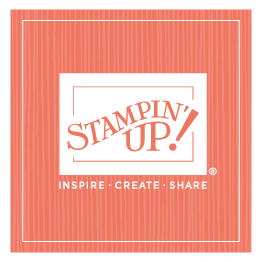 When I moved up here to Washington more than a year ago, I discovered one of my neighbors was a Stampin’ Up! demonstrator, and we became friends. She’s invited me to her swaps and group meetings on occasion, and I’ve loved spending time with my fellow demonstrators. So when one of her upline, also a friend of mine (aren’t we all friends as Stampin' Up! demos? ), invited me to demonstrate at this last meeting, I was honored—and very nervous! When I got there, I found out I was last. That means I had to be nervous through the whole meeting. It didn’t help any that the women who demonstrated before me showed fantastic samples; I chose easy and simple, so I was worried. When it was my turn, I told everyone that I could demonstrate at a workshop, no problem, but I was plenty nervous about the 10 minutes I was supposed to take in front of them. The difference, of course, is that the audience at a workshop doesn’t always know a lot about stamping, so if I mess up they won’t know. But at a group meeting, everyone is an experienced stamper! Everyone welcomed me warmly, though, and it was a great experience. I had lots of fun coming up with the sample. I called the technique I showed “a different twist on emboss resist,” but one of the demonstrators at the meeting told me there was a more official term: faux emerging color... sounds good to me. Start by stamping image(s) in VersaMark on Designer Series paper; the greater contrast the better. 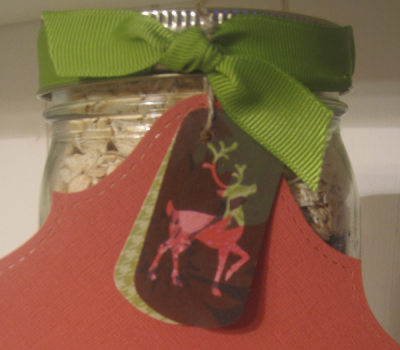 Emboss with clear embossing powder, then rub Chocolate Chip ink on top of that with a dauber. The DSP shows through. I demonstrated the Kindred Spirits card at the meeting and also displayed the other five samples. I really liked the way it looked, and it was so simple and fast! With five little kids, that makes it a Wow for me. I hope you guys like it too. And if you like me guest posting, maybe I’ll sneak in here again sometime!